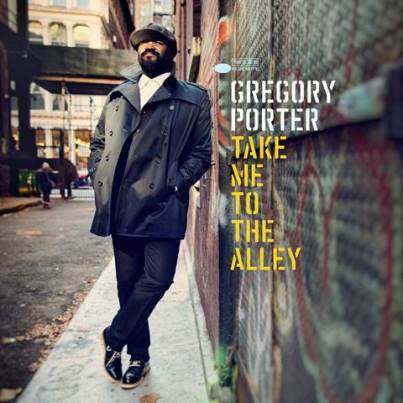 Gregory Porter | Take Me To The Alley - TheUrbanMusicScene.com | Music Reviews! Singer-Songwriter Gregory Porter has settled into a cozy, pleasantly ambiguous style of musical storytelling that is as poetic, comforting and life affirming as it is spiritual and jazzily spirited. Supported by his outstanding band and special guests Lalah Hathaway and KEM, Porter’s fourth offering, Take Me To The Alley, brims with grown folks reflections and perspectives on life and love, delivered by a man who is unquestionably this era’s answer to Bill Withers and Terry Callier. Like fine wine and food, Porter’s generous 14-song latest plays like impeccably matched pairings. The protagonists in the album-opening “Holding On” and the mid-CD “Daydream” are men of some age making markers and adjustments as they navigate their day-to-days more conscious of time but steadfast in their goals. The first single, “Don’t Lose Your Steam,” is dedicated to Porter’s son, Demyan, instilling his 3 year-old torchbearer with pride and purpose over a soulful New Orleans groove. The depth of pure love is assessed with tenderness on “More Than a Woman” and “Consequence of Love” as well as the equally real stumbling block of outside temptations on “Insanity” and “Don’t Be A Fool.” On the latter two, Porter’s underlying message is to never lose sight of what you have and the beauty of how it all began. However, one should recognize when it’s time to “let it go” as Porter sings on “In Fashion” which sounds like Teddy Pendergrass meets Elton John (thanks to pianist Chip Crawford)! Most poignant are two songs with touchingly spiritual undertones. “In Heaven” (penned by Gregory’s cousin Darlene Andrews in honor of his recently departed mother) gently assures loved ones that they are not to be found on Earth but in the space above when you lift your chin skyward. Then there is the title track, “Take Me To The Alley,” that alludes to a man of God, or the second coming of Christ, bypassing the pomp and circumstance of his arrival to go straight to the poor people in need of his love and light most. The voice of Alicia Olatuja in tandem with Porter’s creates a heart-stilling effect. Porter’s more fervently voiced and rhythmically intense numbers – the jubilant non-violence protest anthem “Fan the Flames” and the jazziest jam “French African Queen” – are wisely programmed toward the home stretch of the disc as if a finale at a concert. Then the sweetest of encores arrive with two bonus track remixes that find Porter opening himself to more contemporary sonics in CD-closing collaborations with R&B stars Lalah Hathaway (“Insanity” – Gregory’s finest female duet to date) and KEM (“Holding On”). As if all of this vocal and compositional excellence weren’t enough, Porter co-produced the album himself with longtime musical partner Kamau Kenyatta. Throughout, Porter’s symbiotic rhythm section of Aaron James on bass and Emanuel Harrold on drums as well as soloists Keyon Harrold on open and muted trumpets, Yosuke Sato on alto sax, Tivon Pennicott on tenor sax and Ondrej Pivec on organ make the ride a seamless and richly expressive joy to behold. Symbolically, Gregory released this album on May 6, his mother’s birthday. If there is any justice in today’s insane world of music, Take Me To The Alley will quadruple Gregory Porter’s worldwide audience as ears starved to hear such voices and sentiments marinate in the call of their gentle champion whose time is now.